De-seed the pomegranate and put the fruit into a bowl. Season with salt and pepper, add a squeeze of lemon juice and a drizzle of olive oil. Take the meat off the chicken and cut into 2cm pieces. (Reserve the carcass to use for some chicken stock). Put the chicken into another bowl and add 3 tablespoons of lemon juice, the balsamic vinegar and about 6 tablespoons of olive oil. Toss well and season. Cut the chicory and put it into a bowl with the watercress. 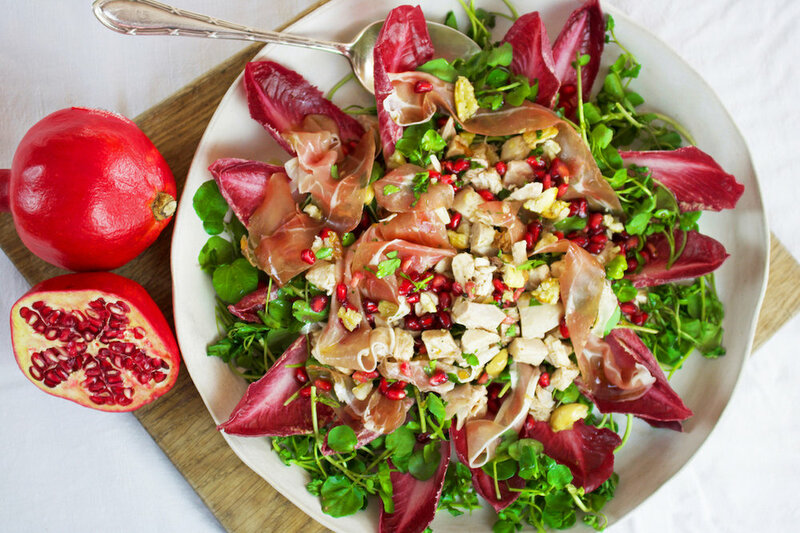 Add the pomegranate, the prosciutto which you have cut into slices and the marinated chicken. Sprinkle the chestnuts over the top. Drizzle with the rest of the lemon juice if there is any and a little walnut oil. Toss together and serve.